What's the point of having a website if no one goes to it? How do you attract the right visitors to your website? Even if you have a great website, how do you get those most desirable people to find your site? We use the latest search engine marketing tools to aid in ensuring that the top search engines give your website the highest possible rankings for your keywords. Search Engine Optimization (SEO) is the process of designing, writing, programming, and structuring a website so that it will rank high in search-engine results. Unlike paid search-engine ads or, "inorganic listings", which typically appear as “sponsored ads” at the top or side of a search results page, “organic listings” appear in the body of the search results page. These are ranked based upon complex changing algorithm ranking systems, which are uniquely determined by each individual search engine. 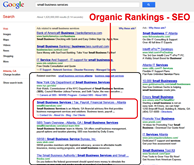 Organic listings typically make up the majority of the search results page and can be ethically manipulated by experts through proven search engine optimization techniques. The Search Engine Optimization (SEO) process is highly skilled and requires a comprehensive understanding of resources, along with time and expertise. Top-ranked websites can translate into increased revenues adding thousands or millions of dollars per year to the bottom line. In order to achieve this, it is imperative that you have an internet marketing campaign that practices paid search-engine placement and Search Engine Optimization techniques. It has been proven that top-ranked websites will return not only market share growth, but also a higher Return On Investment. List and register your company across the top local search directories. Contact Us about SEO Services!